The face of every model in the Macan range lays bare the dominant sporty genes of their hereditary line. Markers include the characteristic headlights, which are recessed in the hood. The large, imposing air intakes of the front fascia are just waiting to inhale fresh air. Every single second. The hood stretches through to the wheel arches. The side profile is typically Porsche. From this angle, every muscle appears flexed -- like a predator ready to pounce. The roof line slopes distinctively down towards the rear, drawing the customary sports car contour that promises excellent aerodynamics. Our designers call it the Porsche flyline. High performance is something that the Macan would never do without. Its 2.0-liter engine generates 252 hp and helps it to sprint from 0 to 60 mph in only 6.3 seconds. Top track speed is 142 mph. A visual highlight of the Macan is the sideblades. Not only do they set a sporty accent, their design pays homage to the 918 Spyder. They make the proportions of the doors appear narrower and the flanks seem much sleeker and sportier. Sideblades are available in matte black, Lava Black, in the exterior color of the vehicle or -- for a particularly exclusive statement -- in carbon fiber. The styling of the rear hatch gives the rear end a particularly harmonious form. For convenience, the rear hatch on all Macan models is equipped with an automatic powerlift function. The slimline LED taillights have three-dimensional proportions, which gives them an extraordinary appearance of depth -- and captures your attention. The overall effect is to make the Macan look low, wide and thus intimate with the road -- like any genuine Porsche. After all, a muscle-toned body is meant to be admired from the rear as well as the front. The steel spring suspension, fitted as standard, helps to provide the driving precision and performance typical of any Porsche. As an option, it can be upgraded to include optional Porsche Active Suspension Management (PASM). At the push of a button, the shock absorbers respond even more precisely to the current driving style. An air suspension is available for even greater dynamic performance and a high level of ride comfort. With this suspension, the Macan sits 10 mm lower. The three-position ride-height adjustment capability enables you to adapt it optimally to the driving situation. At Porsche, we also set ourselves high standards for braking performance. So, it goes without saying that our brake systems are super-sized and adapted to the high-power output of the engine. On the front axle, the Macan uses 4-piston fixed calipers finished in black featuring a 345mm front rotor. The Macan S is upgraded to a 6-piston fixed front calipers. The S receives a silver finish and 350mm rotor. On the rear axle, the Macan and Macan S get 330mm rotors. All Macan models are equipped, as standard, with full-size airbags for the driver and front passenger. These are supplemented by the Porsche Side Impact Protection System (POSIP). It comprises side airbags in the front seats, curtain airbags along the entire roof frame and the side windows from the A-pillar to the C-pillar and side impact protection elements in the doors. Side airbags for the rear compartment, along with driver and passenger knee bags, are standard. Two auxiliary sensors in the bumper help to detect frontal collisions. A cluster of acceleration and yaw rate sensors detects a threat of rollover and triggers the curtain airbags and seat belt pretensioners. PSM is an electronic control system that helps to maintain stability -- and increases driving safety -- even at the limits of sporty performance. Sensors continuously monitor driving direction, speed, yaw velocity and lateral acceleration. PSM actively intervenes to stabilize the vehicle when necessary by strategically applying the brakes at individual wheels. That's not all. If the driver suddenly releases the accelerator pedal, PSM primes the brake system for a higher state of readiness. Maximum braking power is therefore achieved much sooner. Integral ABS is optimized for short braking distances. 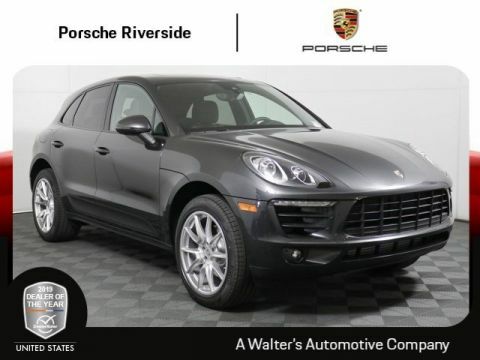 This Macan has the following options: 4F6 Porsche Entry & Drive 7Y7 Lane Change Assist (LCA) 9JB Smoking Package A1 Black C5F 18 Macan S Wheel IU2 Porsche Connect VC Standard Interior in Black Meet your new 2018 Porsche Macan at Walter's Porsche Riverside located at 8423 Indiana Ave. Riverside, CA 92504.Price plus government fees and taxes, any finance charges, any dealer document processing charge, any electronic filing charge and any emission testing charge. Prices and offers on inventory expire each night at midnight. The face of every model in the Macan range lays bare the dominant sporty genes of their hereditary line. Markers include the characteristic headlights, which are recessed in the hood. The large, imposing air intakes of the front fascia are just waiting to inhale fresh air. Every single second. The hood stretches through to the wheel arches. The side profile is typically Porsche. From this angle, every muscle appears flexed -- like a predator ready to pounce. The roof line slopes distinctively down towards the rear, drawing the customary sports car contour that promises excellent aerodynamics. Our designers call it the Porsche flyline. High performance is something that the Macan would never do without. Its 2.0-liter engine generates 252 hp and helps it to sprint from 0 to 60 mph in only 6.3 seconds. Top track speed is 142 mph. A visual highlight of the Macan is the sideblades. Not only do they set a sporty accent, their design pays homage to the 918 Spyder. They make the proportions of the doors appear narrower and the flanks seem much sleeker and sportier. Sideblades are available in matte black, Lava Black, in the exterior color of the vehicle or -- for a particularly exclusive statement -- in carbon fiber. The styling of the rear hatch gives the rear end a particularly harmonious form. For convenience, the rear hatch on all Macan models is equipped with an automatic powerlift function. The slimline LED taillights have three-dimensional proportions, which gives them an extraordinary appearance of depth -- and captures your attention. The overall effect is to make the Macan look low, wide and thus intimate with the road -- like any genuine Porsche. After all, a muscle-toned body is meant to be admired from the rear as well as the front. The steel spring suspension, fitted as standard, helps to provide the driving precision and performance typical of any Porsche. As an option, it can be upgraded to include optional Porsche Active Suspension Management (PASM). At the push of a button, the shock absorbers respond even more precisely to the current driving style. An air suspension is available for even greater dynamic performance and a high level of ride comfort. With this suspension, the Macan sits 10 mm lower. The three-position ride-height adjustment capability enables you to adapt it optimally to the driving situation. At Porsche, we also set ourselves high standards for braking performance. So, it goes without saying that our brake systems are super-sized and adapted to the high-power output of the engine. On the front axle, the Macan uses 4-piston fixed calipers finished in black featuring a 345mm front rotor. The Macan S is upgraded to a 6-piston fixed front calipers. The S receives a silver finish and 350mm rotor. On the rear axle, the Macan and Macan S get 330mm rotors. All Macan models are equipped, as standard, with full-size airbags for the driver and front passenger. These are supplemented by the Porsche Side Impact Protection System (POSIP). It comprises side airbags in the front seats, curtain airbags along the entire roof frame and the side windows from the A-pillar to the C-pillar and side impact protection elements in the doors. Side airbags for the rear compartment, along with driver and passenger knee bags, are standard. Two auxiliary sensors in the bumper help to detect frontal collisions. A cluster of acceleration and yaw rate sensors detects a threat of rollover and triggers the curtain airbags and seat belt pretensioners. PSM is an electronic control system that helps to maintain stability -- and increases driving safety -- even at the limits of sporty performance. Sensors continuously monitor driving direction, speed, yaw velocity and lateral acceleration. PSM actively intervenes to stabilize the vehicle when necessary by strategically applying the brakes at individual wheels. That's not all. If the driver suddenly releases the accelerator pedal, PSM primes the brake system for a higher state of readiness. Maximum braking power is therefore achieved much sooner. Integral ABS is optimized for short braking distances. 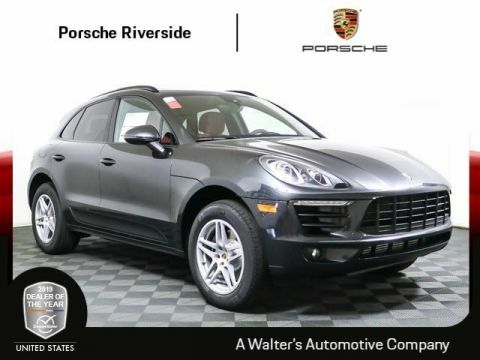 This Macan has the following options: 1NP Wheel Center Caps with Colored Porsche Crest 4A3 Seat Heating (Front) 4F6 Porsche Entry & Drive 7Y7 Lane Change Assist (LCA) 9JB Smoking Package A1 Black IU2 Porsche Connect VI Leather Package in Black/Garnet Red Meet your new 2018 Porsche Macan at Walter's Porsche Riverside located at 8423 Indiana Ave. Riverside, CA 92504.Price plus government fees and taxes, any finance charges, any dealer document processing charge, any electronic filing charge and any emission testing charge. Prices and offers on inventory expire each night at midnight. 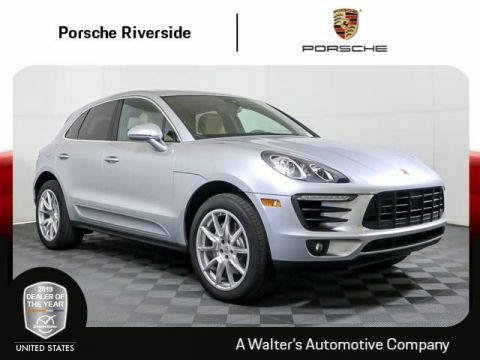 This Porsche Macan includes the following options: 0NA Deletion of Model Designation 2H Volcano Grey Metallic 3FU Panoramic Roof System 3L4 Driver Memory Package 4A3 Seat Heating (Front) 7Y7 Lane Change Assist (LCA) 9JB Smoking Package CY4 20 Macan SportDesign Wheels IU2 Porsche Connect VC Standard Interior in BlackPrice plus government fees and taxes, any finance charges, any dealer document processing charge, any electronic filing charge and any emission testing charge. Prices and offers on inventory expire each night at midnight. The face of every model in the Macan range lays bare the dominant sporty genes of their hereditary line. Markers include the characteristic headlights, which are recessed in the hood. The large, imposing air intakes of the front fascia are just waiting to inhale fresh air. Every single second. The hood stretches through to the wheel arches. The side profile is typically Porsche. From this angle, every muscle appears flexed -- like a predator ready to pounce. The roof line slopes distinctively down towards the rear, drawing the customary sports car contour that promises excellent aerodynamics. Our designers call it the Porsche flyline. High performance is something that the Macan would never do without. Its 2.0-liter engine generates 252 hp and helps it to sprint from 0 to 60 mph in only 6.3 seconds. Top track speed is 142 mph. A visual highlight of the Macan is the sideblades. Not only do they set a sporty accent, their design pays homage to the 918 Spyder. They make the proportions of the doors appear narrower and the flanks seem much sleeker and sportier. Sideblades are available in matte black, Lava Black, in the exterior color of the vehicle or -- for a particularly exclusive statement -- in carbon fiber. The styling of the rear hatch gives the rear end a particularly harmonious form. For convenience, the rear hatch on all Macan models is equipped with an automatic powerlift function. The slimline LED taillights have three-dimensional proportions, which gives them an extraordinary appearance of depth -- and captures your attention. The overall effect is to make the Macan look low, wide and thus intimate with the road -- like any genuine Porsche. After all, a muscle-toned body is meant to be admired from the rear as well as the front. The steel spring suspension, fitted as standard, helps to provide the driving precision and performance typical of any Porsche. As an option, it can be upgraded to include optional Porsche Active Suspension Management (PASM). At the push of a button, the shock absorbers respond even more precisely to the current driving style. An air suspension is available for even greater dynamic performance and a high level of ride comfort. With this suspension, the Macan sits 10 mm lower. The three-position ride-height adjustment capability enables you to adapt it optimally to the driving situation. At Porsche, we also set ourselves high standards for braking performance. So, it goes without saying that our brake systems are super-sized and adapted to the high-power output of the engine. On the front axle, the Macan uses 4-piston fixed calipers finished in black featuring a 345mm front rotor. The Macan S is upgraded to a 6-piston fixed front calipers. The S receives a silver finish and 350mm rotor. On the rear axle, the Macan and Macan S get 330mm rotors. All Macan models are equipped, as standard, with full-size airbags for the driver and front passenger. These are supplemented by the Porsche Side Impact Protection System (POSIP). It comprises side airbags in the front seats, curtain airbags along the entire roof frame and the side windows from the A-pillar to the C-pillar and side impact protection elements in the doors. Side airbags for the rear compartment, along with driver and passenger knee bags, are standard. Two auxiliary sensors in the bumper help to detect frontal collisions. A cluster of acceleration and yaw rate sensors detects a threat of rollover and triggers the curtain airbags and seat belt pretensioners. PSM is an electronic control system that helps to maintain stability -- and increases driving safety -- even at the limits of sporty performance. Sensors continuously monitor driving direction, speed, yaw velocity and lateral acceleration. PSM actively intervenes to stabilize the vehicle when necessary by strategically applying the brakes at individual wheels. That's not all. If the driver suddenly releases the accelerator pedal, PSM primes the brake system for a higher state of readiness. Maximum braking power is therefore achieved much sooner. Integral ABS is optimized for short braking distances. This Macan has the following options: 1NP Wheel Center Caps with Colored Porsche Crest 2H Volcano Grey Metallic 4A3 Seat Heating (Front) 4D3 Seat Ventilation (Front) 4F6 Porsche Entry & Drive 7UG Navigation Module for Porsche Communication Management (PCM) 7Y7 Lane Change Assist (LCA) 9JB Smoking Package C5F 18 Macan S Wheel IV2 Porsche Connect Plus PE5 Power Seats (14-way) with Memory Package VC Standard Interior in Black Meet your new 2018 Porsche Macan at Walter's Porsche Riverside located at 8423 Indiana Ave. Riverside, CA 92504.Price plus government fees and taxes, any finance charges, any dealer document processing charge, any electronic filing charge and any emission testing charge. Prices and offers on inventory expire each night at midnight. The face of every model in the Macan range lays bare the dominant sporty genes of their hereditary line. Markers include the characteristic headlights, which are recessed in the hood. The large, imposing air intakes of the front fascia are just waiting to inhale fresh air. Every single second. The hood stretches through to the wheel arches. The side profile is typically Porsche. From this angle, every muscle appears flexed -- like a predator ready to pounce. The roof line slopes distinctively down towards the rear, drawing the customary sports car contour that promises excellent aerodynamics. Our designers call it the Porsche flyline. High performance is something that the Macan would never do without. Its 2.0-liter engine generates 252 hp and helps it to sprint from 0 to 60 mph in only 6.3 seconds. Top track speed is 142 mph. A visual highlight of the Macan is the sideblades. Not only do they set a sporty accent, their design pays homage to the 918 Spyder. They make the proportions of the doors appear narrower and the flanks seem much sleeker and sportier. Sideblades are available in matte black, Lava Black, in the exterior color of the vehicle or -- for a particularly exclusive statement -- in carbon fiber. The styling of the rear hatch gives the rear end a particularly harmonious form. For convenience, the rear hatch on all Macan models is equipped with an automatic powerlift function. The slimline LED taillights have three-dimensional proportions, which gives them an extraordinary appearance of depth -- and captures your attention. The overall effect is to make the Macan look low, wide and thus intimate with the road -- like any genuine Porsche. After all, a muscle-toned body is meant to be admired from the rear as well as the front. The steel spring suspension, fitted as standard, helps to provide the driving precision and performance typical of any Porsche. As an option, it can be upgraded to include optional Porsche Active Suspension Management (PASM). At the push of a button, the shock absorbers respond even more precisely to the current driving style. An air suspension is available for even greater dynamic performance and a high level of ride comfort. With this suspension, the Macan sits 10 mm lower. The three-position ride-height adjustment capability enables you to adapt it optimally to the driving situation. At Porsche, we also set ourselves high standards for braking performance. So, it goes without saying that our brake systems are super-sized and adapted to the high-power output of the engine. On the front axle, the Macan uses 4-piston fixed calipers finished in black featuring a 345mm front rotor. The Macan S is upgraded to a 6-piston fixed front calipers. The S receives a silver finish and 350mm rotor. On the rear axle, the Macan and Macan S get 330mm rotors. All Macan models are equipped, as standard, with full-size airbags for the driver and front passenger. These are supplemented by the Porsche Side Impact Protection System (POSIP). It comprises side airbags in the front seats, curtain airbags along the entire roof frame and the side windows from the A-pillar to the C-pillar and side impact protection elements in the doors. Side airbags for the rear compartment, along with driver and passenger knee bags, are standard. Two auxiliary sensors in the bumper help to detect frontal collisions. A cluster of acceleration and yaw rate sensors detects a threat of rollover and triggers the curtain airbags and seat belt pretensioners. PSM is an electronic control system that helps to maintain stability -- and increases driving safety -- even at the limits of sporty performance. Sensors continuously monitor driving direction, speed, yaw velocity and lateral acceleration. PSM actively intervenes to stabilize the vehicle when necessary by strategically applying the brakes at individual wheels. That's not all. If the driver suddenly releases the accelerator pedal, PSM primes the brake system for a higher state of readiness. Maximum braking power is therefore achieved much sooner. Integral ABS is optimized for short braking distances. This Macan has the following options: 0Q White 1D6 Trailer hitch without tow ball 1NP Wheel Center Caps with Colored Porsche Crest 3GN Cargo Management System 4F6 Porsche Entry & Drive 5ZF Porsche Crest on Headrests (front and rear) 7UG Navigation Module for Porsche Communication Management (PCM) 7Y7 Lane Change Assist (LCA) 8A4 ParkAssist (Front and Rear) with Surround View PE5 Power Seats (14-way) with Memory Package PJ5 Premium Package VC Standard Interior in Black Meet your new 2018 Porsche Macan at Walter's Porsche Riverside located at 8423 Indiana Ave. Riverside, CA 92504.Price plus government fees and taxes, any finance charges, any dealer document processing charge, any electronic filing charge and any emission testing charge. Prices and offers on inventory expire each night at midnight. The face of every model in the Macan range lays bare the dominant sporty genes of their hereditary line. Markers include the characteristic headlights, which are recessed in the hood. The large, imposing air intakes of the front fascia are just waiting to inhale fresh air. Every single second. The hood stretches through to the wheel arches. The side profile is typically Porsche. From this angle, every muscle appears flexed -- like a predator ready to pounce. The roof line slopes distinctively down towards the rear, drawing the customary sports car contour that promises excellent aerodynamics. Our designers call it the Porsche flyline. High performance is something that the Macan would never do without. Its 2.0-liter engine generates 252 hp and helps it to sprint from 0 to 60 mph in only 6.3 seconds. Top track speed is 142 mph. A visual highlight of the Macan is the sideblades. Not only do they set a sporty accent, their design pays homage to the 918 Spyder. They make the proportions of the doors appear narrower and the flanks seem much sleeker and sportier. Sideblades are available in matte black, Lava Black, in the exterior color of the vehicle or -- for a particularly exclusive statement -- in carbon fiber. The styling of the rear hatch gives the rear end a particularly harmonious form. For convenience, the rear hatch on all Macan models is equipped with an automatic powerlift function. The slimline LED taillights have three-dimensional proportions, which gives them an extraordinary appearance of depth -- and captures your attention. The overall effect is to make the Macan look low, wide and thus intimate with the road -- like any genuine Porsche. After all, a muscle-toned body is meant to be admired from the rear as well as the front. The steel spring suspension, fitted as standard, helps to provide the driving precision and performance typical of any Porsche. As an option, it can be upgraded to include optional Porsche Active Suspension Management (PASM). At the push of a button, the shock absorbers respond even more precisely to the current driving style. An air suspension is available for even greater dynamic performance and a high level of ride comfort. With this suspension, the Macan sits 10 mm lower. The three-position ride-height adjustment capability enables you to adapt it optimally to the driving situation. At Porsche, we also set ourselves high standards for braking performance. So, it goes without saying that our brake systems are super-sized and adapted to the high-power output of the engine. On the front axle, the Macan uses 4-piston fixed calipers finished in black featuring a 345mm front rotor. The Macan S is upgraded to a 6-piston fixed front calipers. The S receives a silver finish and 350mm rotor. On the rear axle, the Macan and Macan S get 330mm rotors. All Macan models are equipped, as standard, with full-size airbags for the driver and front passenger. These are supplemented by the Porsche Side Impact Protection System (POSIP). It comprises side airbags in the front seats, curtain airbags along the entire roof frame and the side windows from the A-pillar to the C-pillar and side impact protection elements in the doors. Side airbags for the rear compartment, along with driver and passenger knee bags, are standard. Two auxiliary sensors in the bumper help to detect frontal collisions. A cluster of acceleration and yaw rate sensors detects a threat of rollover and triggers the curtain airbags and seat belt pretensioners. PSM is an electronic control system that helps to maintain stability -- and increases driving safety -- even at the limits of sporty performance. Sensors continuously monitor driving direction, speed, yaw velocity and lateral acceleration. PSM actively intervenes to stabilize the vehicle when necessary by strategically applying the brakes at individual wheels. That's not all. If the driver suddenly releases the accelerator pedal, PSM primes the brake system for a higher state of readiness. Maximum braking power is therefore achieved much sooner. Integral ABS is optimized for short braking distances. This Macan has the following options: 1NP Wheel Center Caps with Colored Porsche Crest 2H Volcano Grey Metallic 3S5 Roof Rails in Black 7Y7 Lane Change Assist (LCA) 9JB Smoking Package C5F 18 Macan S Wheel IU2 Porsche Connect N1B Preparation Two-Tone Leather Interior i.c.w. 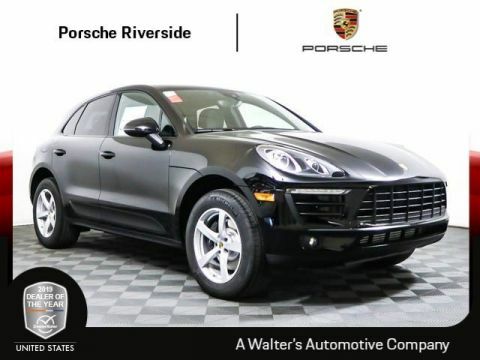 Seat Ventilation PJ7 Premium Package Plus VU Leather Package in Black/Garnet Red Meet your new 2018 Porsche Macan at Walter's Porsche Riverside located at 8423 Indiana Ave. Riverside, CA 92504.Price plus government fees and taxes, any finance charges, any dealer document processing charge, any electronic filing charge and any emission testing charge. Prices and offers on inventory expire each night at midnight. The face of every model in the Macan range lays bare the dominant sporty genes of their hereditary line. Markers include the characteristic headlights, which are recessed in the hood. The large, imposing air intakes of the front fascia are just waiting to inhale fresh air. Every single second. The hood stretches through to the wheel arches. The side profile is typically Porsche. From this angle, every muscle appears flexed -- like a predator ready to pounce. The roof line slopes distinctively down towards the rear, drawing the customary sports car contour that promises excellent aerodynamics. Our designers call it the Porsche flyline. High performance is something that the Macan would never do without. Its 2.0-liter engine generates 252 hp and helps it to sprint from 0 to 60 mph in only 6.3 seconds. Top track speed is 142 mph. A visual highlight of the Macan is the sideblades. Not only do they set a sporty accent, their design pays homage to the 918 Spyder. They make the proportions of the doors appear narrower and the flanks seem much sleeker and sportier. Sideblades are available in matte black, Lava Black, in the exterior color of the vehicle or -- for a particularly exclusive statement -- in carbon fiber. The styling of the rear hatch gives the rear end a particularly harmonious form. For convenience, the rear hatch on all Macan models is equipped with an automatic powerlift function. The slimline LED taillights have three-dimensional proportions, which gives them an extraordinary appearance of depth -- and captures your attention. The overall effect is to make the Macan look low, wide and thus intimate with the road -- like any genuine Porsche. After all, a muscle-toned body is meant to be admired from the rear as well as the front. The steel spring suspension, fitted as standard, helps to provide the driving precision and performance typical of any Porsche. As an option, it can be upgraded to include optional Porsche Active Suspension Management (PASM). At the push of a button, the shock absorbers respond even more precisely to the current driving style. An air suspension is available for even greater dynamic performance and a high level of ride comfort. With this suspension, the Macan sits 10 mm lower. The three-position ride-height adjustment capability enables you to adapt it optimally to the driving situation. At Porsche, we also set ourselves high standards for braking performance. So, it goes without saying that our brake systems are super-sized and adapted to the high-power output of the engine. On the front axle, the Macan uses 4-piston fixed calipers finished in black featuring a 345mm front rotor. The Macan S is upgraded to a 6-piston fixed front calipers. The S receives a silver finish and 350mm rotor. On the rear axle, the Macan and Macan S get 330mm rotors. All Macan models are equipped, as standard, with full-size airbags for the driver and front passenger. These are supplemented by the Porsche Side Impact Protection System (POSIP). It comprises side airbags in the front seats, curtain airbags along the entire roof frame and the side windows from the A-pillar to the C-pillar and side impact protection elements in the doors. Side airbags for the rear compartment, along with driver and passenger knee bags, are standard. Two auxiliary sensors in the bumper help to detect frontal collisions. A cluster of acceleration and yaw rate sensors detects a threat of rollover and triggers the curtain airbags and seat belt pretensioners. PSM is an electronic control system that helps to maintain stability -- and increases driving safety -- even at the limits of sporty performance. Sensors continuously monitor driving direction, speed, yaw velocity and lateral acceleration. PSM actively intervenes to stabilize the vehicle when necessary by strategically applying the brakes at individual wheels. That's not all. If the driver suddenly releases the accelerator pedal, PSM primes the brake system for a higher state of readiness. Maximum braking power is therefore achieved much sooner. Integral ABS is optimized for short braking distances. 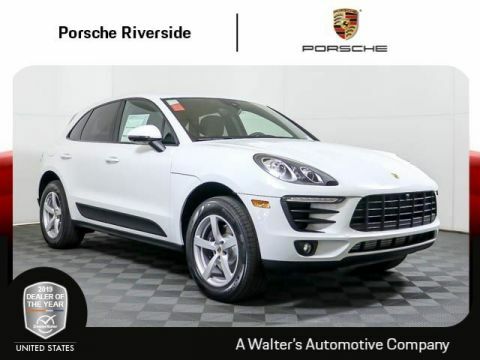 This Macan has the following options: 1NP Wheel Center Caps with Colored Porsche Crest 3S5 Roof Rails in Black 7Y3 Lane Keep Assist (LKA) i.c.w. 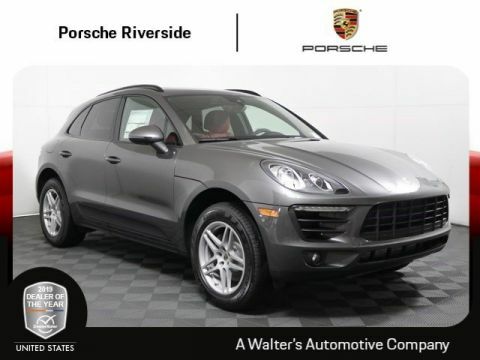 Lane Change Assist (LCA) 9JB Smoking Package C5F 18 Macan S Wheel IU2 Porsche Connect N0 Agate Grey Metallic N1B Preparation Two-Tone Leather Interior i.c.w. 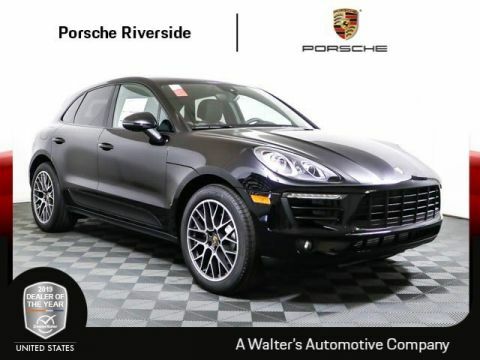 Seat Ventilation PJ7 Premium Package Plus VU Leather Package in Black/Garnet Red Meet your new 2018 Porsche Macan at Walter's Porsche Riverside located at 8423 Indiana Ave. Riverside, CA 92504.Price plus government fees and taxes, any finance charges, any dealer document processing charge, any electronic filing charge and any emission testing charge. Prices and offers on inventory expire each night at midnight. The face of every model in the Macan range lays bare the dominant sporty genes of their hereditary line. Markers include the characteristic headlights, which are recessed in the hood. The large, imposing air intakes of the front fascia are just waiting to inhale fresh air. Every single second. The hood stretches through to the wheel arches. The side profile is typically Porsche. From this angle, every muscle appears flexed -- like a predator ready to pounce. The roof line slopes distinctively down towards the rear, drawing the customary sports car contour that promises excellent aerodynamics. Our designers call it the Porsche flyline. High performance is something that the Macan would never do without. Its 2.0-liter engine generates 252 hp and helps it to sprint from 0 to 60 mph in only 6.3 seconds. Top track speed is 142 mph. A visual highlight of the Macan is the sideblades. Not only do they set a sporty accent, their design pays homage to the 918 Spyder. They make the proportions of the doors appear narrower and the flanks seem much sleeker and sportier. Sideblades are available in matte black, Lava Black, in the exterior color of the vehicle or -- for a particularly exclusive statement -- in carbon fiber. The styling of the rear hatch gives the rear end a particularly harmonious form. For convenience, the rear hatch on all Macan models is equipped with an automatic powerlift function. The slimline LED taillights have three-dimensional proportions, which gives them an extraordinary appearance of depth -- and captures your attention. The overall effect is to make the Macan look low, wide and thus intimate with the road -- like any genuine Porsche. After all, a muscle-toned body is meant to be admired from the rear as well as the front. The steel spring suspension, fitted as standard, helps to provide the driving precision and performance typical of any Porsche. As an option, it can be upgraded to include optional Porsche Active Suspension Management (PASM). At the push of a button, the shock absorbers respond even more precisely to the current driving style. An air suspension is available for even greater dynamic performance and a high level of ride comfort. With this suspension, the Macan sits 10 mm lower. The three-position ride-height adjustment capability enables you to adapt it optimally to the driving situation. At Porsche, we also set ourselves high standards for braking performance. So, it goes without saying that our brake systems are super-sized and adapted to the high-power output of the engine. On the front axle, the Macan uses 4-piston fixed calipers finished in black featuring a 345mm front rotor. The Macan S is upgraded to a 6-piston fixed front calipers. The S receives a silver finish and 350mm rotor. On the rear axle, the Macan and Macan S get 330mm rotors. All Macan models are equipped, as standard, with full-size airbags for the driver and front passenger. These are supplemented by the Porsche Side Impact Protection System (POSIP). It comprises side airbags in the front seats, curtain airbags along the entire roof frame and the side windows from the A-pillar to the C-pillar and side impact protection elements in the doors. Side airbags for the rear compartment, along with driver and passenger knee bags, are standard. Two auxiliary sensors in the bumper help to detect frontal collisions. A cluster of acceleration and yaw rate sensors detects a threat of rollover and triggers the curtain airbags and seat belt pretensioners. PSM is an electronic control system that helps to maintain stability -- and increases driving safety -- even at the limits of sporty performance. Sensors continuously monitor driving direction, speed, yaw velocity and lateral acceleration. PSM actively intervenes to stabilize the vehicle when necessary by strategically applying the brakes at individual wheels. That's not all. If the driver suddenly releases the accelerator pedal, PSM primes the brake system for a higher state of readiness. Maximum braking power is therefore achieved much sooner. Integral ABS is optimized for short braking distances. This Macan has the following options: 7Y7 Lane Change Assist (LCA) 9JB Smoking Package A1 Black VC Standard Interior in Black Meet your new 2018 Porsche Macan at Walter's Porsche Riverside located at 8423 Indiana Ave. Riverside, CA 92504.Price plus government fees and taxes, any finance charges, any dealer document processing charge, any electronic filing charge and any emission testing charge. Prices and offers on inventory expire each night at midnight. The face of every model in the Macan range lays bare the dominant sporty genes of their hereditary line. Markers include the characteristic headlights, which are recessed in the hood. The large, imposing air intakes of the front fascia are just waiting to inhale fresh air. Every single second. The hood stretches through to the wheel arches. The side profile is typically Porsche. From this angle, every muscle appears flexed -- like a predator ready to pounce. The roof line slopes distinctively down towards the rear, drawing the customary sports car contour that promises excellent aerodynamics. Our designers call it the Porsche flyline. High performance is something that the Macan would never do without. Its 2.0-liter engine generates 252 hp and helps it to sprint from 0 to 60 mph in only 6.3 seconds. Top track speed is 142 mph. A visual highlight of the Macan is the sideblades. Not only do they set a sporty accent, their design pays homage to the 918 Spyder. They make the proportions of the doors appear narrower and the flanks seem much sleeker and sportier. Sideblades are available in matte black, Lava Black, in the exterior color of the vehicle or -- for a particularly exclusive statement -- in carbon fiber. The styling of the rear hatch gives the rear end a particularly harmonious form. For convenience, the rear hatch on all Macan models is equipped with an automatic powerlift function. The slimline LED taillights have three-dimensional proportions, which gives them an extraordinary appearance of depth -- and captures your attention. The overall effect is to make the Macan look low, wide and thus intimate with the road -- like any genuine Porsche. After all, a muscle-toned body is meant to be admired from the rear as well as the front. The steel spring suspension, fitted as standard, helps to provide the driving precision and performance typical of any Porsche. As an option, it can be upgraded to include optional Porsche Active Suspension Management (PASM). At the push of a button, the shock absorbers respond even more precisely to the current driving style. An air suspension is available for even greater dynamic performance and a high level of ride comfort. With this suspension, the Macan sits 10 mm lower. The three-position ride-height adjustment capability enables you to adapt it optimally to the driving situation. At Porsche, we also set ourselves high standards for braking performance. So, it goes without saying that our brake systems are super-sized and adapted to the high-power output of the engine. On the front axle, the Macan uses 4-piston fixed calipers finished in black featuring a 345mm front rotor. The Macan S is upgraded to a 6-piston fixed front calipers. The S receives a silver finish and 350mm rotor. On the rear axle, the Macan and Macan S get 330mm rotors. All Macan models are equipped, as standard, with full-size airbags for the driver and front passenger. These are supplemented by the Porsche Side Impact Protection System (POSIP). It comprises side airbags in the front seats, curtain airbags along the entire roof frame and the side windows from the A-pillar to the C-pillar and side impact protection elements in the doors. Side airbags for the rear compartment, along with driver and passenger knee bags, are standard. Two auxiliary sensors in the bumper help to detect frontal collisions. A cluster of acceleration and yaw rate sensors detects a threat of rollover and triggers the curtain airbags and seat belt pretensioners. PSM is an electronic control system that helps to maintain stability -- and increases driving safety -- even at the limits of sporty performance. Sensors continuously monitor driving direction, speed, yaw velocity and lateral acceleration. PSM actively intervenes to stabilize the vehicle when necessary by strategically applying the brakes at individual wheels. That's not all. If the driver suddenly releases the accelerator pedal, PSM primes the brake system for a higher state of readiness. Maximum braking power is therefore achieved much sooner. Integral ABS is optimized for short braking distances. This Macan has the following options: 0P9 Sport Exhaust System incl. 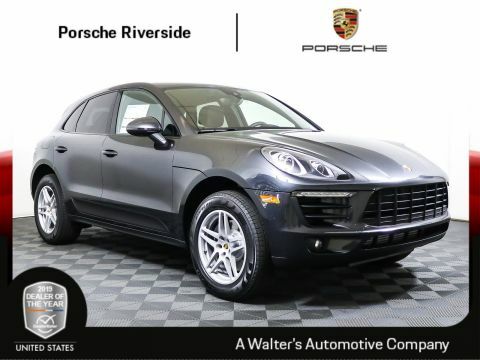 Tailpipes in Black 2T Jet Black Metallic 7Y7 Lane Change Assist (LCA) 9JB Smoking Package VC Standard Interior in Black Meet your new 2018 Porsche Macan at Walter's Porsche Riverside located at 8423 Indiana Ave. Riverside, CA 92504.Price plus government fees and taxes, any finance charges, any dealer document processing charge, any electronic filing charge and any emission testing charge. Prices and offers on inventory expire each night at midnight. The face of every model in the Macan range lays bare the dominant sporty genes of their hereditary line. Markers include the characteristic headlights, which are recessed in the hood. The large, imposing air intakes of the front fascia are just waiting to inhale fresh air. Every single second. The hood stretches through to the wheel arches. The side profile is typically Porsche. From this angle, every muscle appears flexed -- like a predator ready to pounce. The roof line slopes distinctively down towards the rear, drawing the customary sports car contour that promises excellent aerodynamics. Our designers call it the Porsche flyline. High performance is something that the Macan would never do without. Its 2.0-liter engine generates 252 hp and helps it to sprint from 0 to 60 mph in only 6.3 seconds. Top track speed is 142 mph. A visual highlight of the Macan is the sideblades. Not only do they set a sporty accent, their design pays homage to the 918 Spyder. They make the proportions of the doors appear narrower and the flanks seem much sleeker and sportier. Sideblades are available in matte black, Lava Black, in the exterior color of the vehicle or -- for a particularly exclusive statement -- in carbon fiber. The styling of the rear hatch gives the rear end a particularly harmonious form. For convenience, the rear hatch on all Macan models is equipped with an automatic powerlift function. The slimline LED taillights have three-dimensional proportions, which gives them an extraordinary appearance of depth -- and captures your attention. The overall effect is to make the Macan look low, wide and thus intimate with the road -- like any genuine Porsche. After all, a muscle-toned body is meant to be admired from the rear as well as the front. The steel spring suspension, fitted as standard, helps to provide the driving precision and performance typical of any Porsche. As an option, it can be upgraded to include optional Porsche Active Suspension Management (PASM). At the push of a button, the shock absorbers respond even more precisely to the current driving style. An air suspension is available for even greater dynamic performance and a high level of ride comfort. With this suspension, the Macan sits 10 mm lower. The three-position ride-height adjustment capability enables you to adapt it optimally to the driving situation. At Porsche, we also set ourselves high standards for braking performance. So, it goes without saying that our brake systems are super-sized and adapted to the high-power output of the engine. On the front axle, the Macan uses 4-piston fixed calipers finished in black featuring a 345mm front rotor. The Macan S is upgraded to a 6-piston fixed front calipers. The S receives a silver finish and 350mm rotor. On the rear axle, the Macan and Macan S get 330mm rotors. All Macan models are equipped, as standard, with full-size airbags for the driver and front passenger. These are supplemented by the Porsche Side Impact Protection System (POSIP). It comprises side airbags in the front seats, curtain airbags along the entire roof frame and the side windows from the A-pillar to the C-pillar and side impact protection elements in the doors. Side airbags for the rear compartment, along with driver and passenger knee bags, are standard. Two auxiliary sensors in the bumper help to detect frontal collisions. A cluster of acceleration and yaw rate sensors detects a threat of rollover and triggers the curtain airbags and seat belt pretensioners. PSM is an electronic control system that helps to maintain stability -- and increases driving safety -- even at the limits of sporty performance. Sensors continuously monitor driving direction, speed, yaw velocity and lateral acceleration. PSM actively intervenes to stabilize the vehicle when necessary by strategically applying the brakes at individual wheels. That's not all. If the driver suddenly releases the accelerator pedal, PSM primes the brake system for a higher state of readiness. Maximum braking power is therefore achieved much sooner. Integral ABS is optimized for short braking distances. This Macan has the following options: 0P9 Sport Exhaust System incl. Tailpipes in Black 7Y7 Lane Change Assist (LCA) 9JB Smoking Package N5 Night Blue Metallic VC Standard Interior in Black Meet your new 2018 Porsche Macan at Walter's Porsche Riverside located at 8423 Indiana Ave. Riverside, CA 92504.Price plus government fees and taxes, any finance charges, any dealer document processing charge, any electronic filing charge and any emission testing charge. Prices and offers on inventory expire each night at midnight. The face of every model in the Macan range lays bare the dominant sporty genes of their hereditary line. Markers include the characteristic headlights, which are recessed in the hood. The large, imposing air intakes of the front fascia are just waiting to inhale fresh air. Every single second. The hood stretches through to the wheel arches. The side profile is typically Porsche. From this angle, every muscle appears flexed -- like a predator ready to pounce. The roof line slopes distinctively down towards the rear, drawing the customary sports car contour that promises excellent aerodynamics. Our designers call it the Porsche flyline. High performance is something that the Macan would never do without. Its 2.0-liter engine generates 252 hp and helps it to sprint from 0 to 60 mph in only 6.3 seconds. Top track speed is 142 mph. A visual highlight of the Macan is the sideblades. Not only do they set a sporty accent, their design pays homage to the 918 Spyder. They make the proportions of the doors appear narrower and the flanks seem much sleeker and sportier. Sideblades are available in matte black, Lava Black, in the exterior color of the vehicle or -- for a particularly exclusive statement -- in carbon fiber. The styling of the rear hatch gives the rear end a particularly harmonious form. For convenience, the rear hatch on all Macan models is equipped with an automatic powerlift function. The slimline LED taillights have three-dimensional proportions, which gives them an extraordinary appearance of depth -- and captures your attention. The overall effect is to make the Macan look low, wide and thus intimate with the road -- like any genuine Porsche. After all, a muscle-toned body is meant to be admired from the rear as well as the front. The steel spring suspension, fitted as standard, helps to provide the driving precision and performance typical of any Porsche. As an option, it can be upgraded to include optional Porsche Active Suspension Management (PASM). At the push of a button, the shock absorbers respond even more precisely to the current driving style. An air suspension is available for even greater dynamic performance and a high level of ride comfort. With this suspension, the Macan sits 10 mm lower. The three-position ride-height adjustment capability enables you to adapt it optimally to the driving situation. At Porsche, we also set ourselves high standards for braking performance. So, it goes without saying that our brake systems are super-sized and adapted to the high-power output of the engine. On the front axle, the Macan uses 4-piston fixed calipers finished in black featuring a 345mm front rotor. The Macan S is upgraded to a 6-piston fixed front calipers. The S receives a silver finish and 350mm rotor. On the rear axle, the Macan and Macan S get 330mm rotors. All Macan models are equipped, as standard, with full-size airbags for the driver and front passenger. These are supplemented by the Porsche Side Impact Protection System (POSIP). It comprises side airbags in the front seats, curtain airbags along the entire roof frame and the side windows from the A-pillar to the C-pillar and side impact protection elements in the doors. Side airbags for the rear compartment, along with driver and passenger knee bags, are standard. Two auxiliary sensors in the bumper help to detect frontal collisions. A cluster of acceleration and yaw rate sensors detects a threat of rollover and triggers the curtain airbags and seat belt pretensioners. PSM is an electronic control system that helps to maintain stability -- and increases driving safety -- even at the limits of sporty performance. Sensors continuously monitor driving direction, speed, yaw velocity and lateral acceleration. PSM actively intervenes to stabilize the vehicle when necessary by strategically applying the brakes at individual wheels. That's not all. If the driver suddenly releases the accelerator pedal, PSM primes the brake system for a higher state of readiness. Maximum braking power is therefore achieved much sooner. Integral ABS is optimized for short braking distances. This Macan has the following options: 0P9 Sport Exhaust System incl. 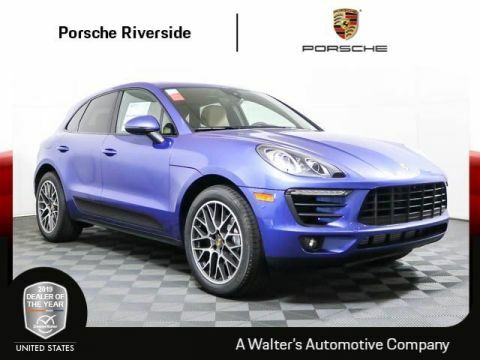 Tailpipes in Black 7Y7 Lane Change Assist (LCA) 9JB Smoking Package N1 Sapphire Blue Metallic VX Standard Interior in Black/Luxor Beige Meet your new 2018 Porsche Macan at Walter's Porsche Riverside located at 8423 Indiana Ave. Riverside, CA 92504.Price plus government fees and taxes, any finance charges, any dealer document processing charge, any electronic filing charge and any emission testing charge. Prices and offers on inventory expire each night at midnight. The face of every model in the Macan range lays bare the dominant sporty genes of their hereditary line. Markers include the characteristic headlights, which are recessed in the hood. The large, imposing air intakes of the front fascia are just waiting to inhale fresh air. Every single second. The hood stretches through to the wheel arches. The side profile is typically Porsche. From this angle, every muscle appears flexed -- like a predator ready to pounce. The roof line slopes distinctively down towards the rear, drawing the customary sports car contour that promises excellent aerodynamics. Our designers call it the Porsche flyline. High performance is something that the Macan would never do without. Its 3.0-liter twin-turbo engine generates 340 hp and helps it to sprint from 0 to 60 mph in only 5.2 seconds (5.0 sec w/ Sport Chrono). Top track speed is 156 mph. A visual highlight of the Macan is the sideblades. Not only do they set a sporty accent, their design pays homage to the 918 Spyder. They make the proportions of the doors appear narrower and the flanks seem much sleeker and sportier. Sideblades are available in matte black, Lava Black, in the exterior color of the vehicle or -- for a particularly exclusive statement -- in carbon fiber. The styling of the rear hatch gives the rear end a particularly harmonious form. For convenience, the rear hatch on all Macan models is equipped with an automatic powerlift function. The slimline LED taillights have three-dimensional proportions, which gives them an extraordinary appearance of depth -- and captures your attention. The overall effect is to make the Macan look low, wide and thus intimate with the road -- like any genuine Porsche. After all, a muscle-toned body is meant to be admired from the rear as well as the front. The intake and exhaust camshafts in all Macan models with petrol engine are each equipped with a fully variable vanecell controller for continuous timing adjustments. 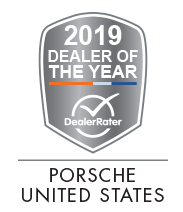 This helps to deliver high specific power and high torque -- even at low engine speeds -- and, above all, reduced fuel consumption and low emissions. With their twin-turbo V6 engine, the Macan S is additionally equipped with VarioCam Plus. This system switches the lift of the intake valves, resulting in instant acceleration and smooth engine running performance. The tremendous dynamic performance of the new Macan is thanks in part to the Porsche Traction Management (PTM) active all-wheel drive system. It comprises an electronic and map-controlled multi-plate clutch, the automatic brake differential (ABD) and anti-slip regulation (ASR). The electronically controlled multiplate clutch regulates the distribution of drive force between the rear axle and the front axle. Driving conditions are constantly monitored to enable a precise and lightning-quick response to a variety of situations. At Porsche, we also set ourselves high standards for braking performance. So, it goes without saying that our brake systems are super-sized and adapted to the high-power output of the engine. On the front axle, the Macan uses 4-piston fixed calipers finished in black featuring a 345mm front rotor. The Macan S is upgraded to a 6-piston fixed front calipers. The S receives a silver finish and 350mm rotor. On the rear axle, the Macan and Macan S get 330mm rotors. All Macan models are equipped, as standard, with full-size airbags for the driver and front passenger. These are supplemented by the Porsche Side Impact Protection System (POSIP). It comprises side airbags in the front seats, curtain airbags along the entire roof frame and the side windows from the A-pillar to the C-pillar and side impact protection elements in the doors. Side airbags for the rear compartment, along with driver and passenger knee bags, are standard. Two auxiliary sensors in the bumper help to detect frontal collisions. A cluster of acceleration and yaw rate sensors detects a threat of rollover and triggers the curtain airbags and seat belt pretensioners. PSM is an electronic control system that helps to maintain stability -- and increases driving safety -- even at the limits of sporty performance. Sensors continuously monitor driving direction, speed, yaw velocity and lateral acceleration. PSM actively intervenes to stabilize the vehicle when necessary by strategically applying the brakes at individual wheels. That's not all. If the driver suddenly releases the accelerator pedal, PSM primes the brake system for a higher state of readiness. Maximum braking power is therefore achieved much sooner. Integral ABS is optimized for short braking distances. This Macan S has the following options: 2W6 Fuel Cap with Aluminum Look Finish 6FB SportDesign Side Mirrors 6H1 Side Blades in Exterior Color 7UG Navigation Module for Porsche Communication Management (PCM) 7Y7 Lane Change Assist (LCA) 8T3 Adaptive Cruise Control (ACC) 9JB Smoking Package CY4 20 Macan SportDesign Wheels IV2 Porsche Connect Plus PJ7 Premium Package Plus S2 Rhodium Silver Metallic VZ Leather Package in Black/Luxor Beige Meet your new 2018 Porsche Macan S at Walter's Porsche Riverside located at 8423 Indiana Ave. Riverside, CA 92504.Price plus government fees and taxes, any finance charges, any dealer document processing charge, any electronic filing charge and any emission testing charge. Prices and offers on inventory expire each night at midnight. The Porsche Macan is the compact SUV as only Porsche engineers could have imagined it. It’s concentrated and intense, while being powerful and versatile. Although it delivers the incredible performance that drivers expect from the brand, it performs as efficiently as possible. Engineers designed the Macan with two main priorities in mind: passenger safety and comfort—making the Porsche Macan a magnificent vehicle option for Los Angeles and Riverside area families. Check out our current Porsche Macan lease specials and get behind the wheel of an all-new Porsche Macan today. The Macan delivers ample room to suit the active lifestyles of shoppers at our Riverside Porsche dealership, but when it comes to performance, Porsche engineers left no room for compromise. All Macan models were designed to keep with the Porsche philosophy—bringing sporty style and performance most commonly found on the racetrack and bringing it to your every day. Get a first-hand experience behind the wheel of the Macan today; schedule a test drive with us. 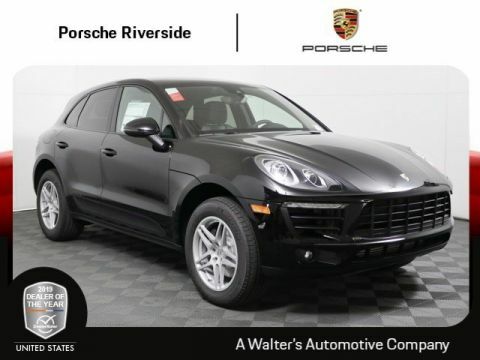 For more information about this compact SUV, contact your local Porsche Macan dealership – Porsche Riverside or give us a call.